(left to right) Drs. David Halpern and Steven Murawski. The Gulf of Mexico Research Initiative (GoMRI) community congratulates the recent appointment of two of their own – Drs. 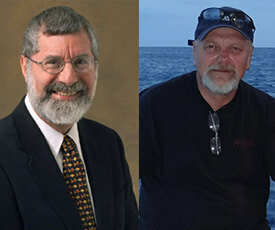 David Halpern and Steven Murawski – to the National Research Council Ocean Studies Board (OSB). OSB members are appointed for three-year terms with the opportunity to be extended for an additional three-year term. The wide-ranging expertise of Board members reflects the broad agenda of the OSB. Dr. Halpern, GoMRI Research Board member, and Dr. Murawski, Director for the GoMRI-funded Center for Integrated Modeling and Analysis of Gulf Ecosystems (C-IMAGE) consortium, join Dr. Rita Colwell, Chair of the GoMRI Research Board, who also serves on the OSB. Dr. Nancy Rabalais, Director of the GoMRI-funded Coastal Waters Consortium (CWC), is a former OSB Chair. Read the OSB member biographies of Drs. Colwell, Halpern, and Murawski for details about their long-term active involvement in and service to the science community. The OSB explores the science, policies, and infrastructure needed to understand, manage, and conserve coastal and marine environments and resources. The board communicates with, advises, undertakes studies, and responds to specific request from federal agencies, Congress, and others in addition to its own initiatives. The board provides leadership to address ocean-related issues and their impacts on policy and provides independent evaluations on the quality and relevance of ocean research. The GoMRI Research Board consists of twenty members – ten appointed by BP and ten appointed by the Gulf of Mexico Alliance. The Research Board is the decision-making and oversight body regarding research conducted pursuant to the GoMRI and ensures the intellectual quality, research effectiveness, and academic independence of the GoMRI programs. The C-IMAGE and CWC are two of eight GoMRI-funded research consortia that conduct research related to the Deepwater Horizon oil spill. The GoMRI research program is a 10-year, $500 million independent research program established by an agreement between BP and the Gulf of Mexico Alliance to study the effects of the Deepwater Horizon incident and the potential associated impact of this and similar incidents on the environment and public health.